If there is one food item that is true local product, it is Akasan, Haitian Cornmeal Drink or anything made with corn. It is originated with the indigenous peoples of the Americas, our Tainos ancestors. Akasan is usually served with fresh bread rolls for breakfast. However, it can also be served as a drink for lunch, before bed, or as a snack. 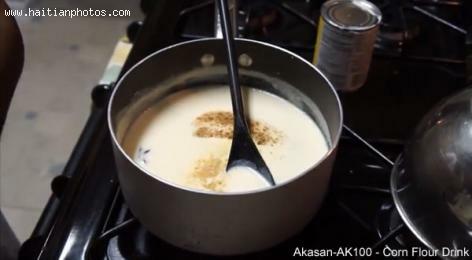 An excellent and refreshing Akasan is a type of sweet corn milkshake. In Haiti, Akasan is usually sold at the local grocery store; however many people are now having it home made. This was not the case for me when I was growing up in my neighborhood in the city of Cap-Haitian. I can still remember to make sure you have Akasan served on your table before going to school, someone had to wake up very early to purchase it.